Beautifully natural plastic surgery results are the norm with accomplished surgeons, but scars are still a trade-off whenever a scalpel is involved. Patients who know their results will turn out well still hesitate at the thought of scarring – and it may well ultimately finalize their decision one way or the other. 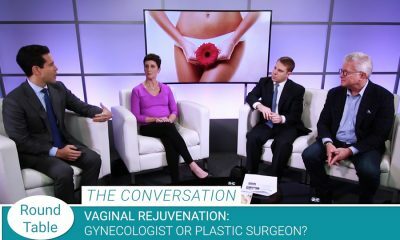 In this round table, board certified plastic surgeons discuss patients’s hesitation when it comes to opting in for surgery that leaves scars. While there are no scar-free surgical procedures, mitigating technology and technique do exist and can heal scars better than ever before. While progress in surgical technique has increased dramatically over the past few decades, anytime the body is opened with a scalpel, a scar will tell that tale. What surgeons can do in modern surgery is perform deft surgical techniques to minimize the scar’s prominence, a skill that plastic surgeons excel at above all others. “It’s been said that the only doctors who don’t leave scars are the ones that are on TV, right?” says Dr. Brian Brzowski of Utah. “It’s the bane of plastic surgery for anything that we do that involves a scalpel – we’re going to end up with a scar. And of course, the priority is to end up with the best scar possible, but patients have to understand the reality that scars will exist. Leaping the scar hurdle is an important point during a patient’s consultation with their surgeon. The exciting conversation about how successful a tummy tuck or breast augmentation will be has to be paired with the understanding that success comes with scars, and the surgeon is going to do everything in their power to minimize them. “The things that help lessen the likelihood of getting a thick, ugly scar are going to be meticulous suture closure, very gentle tissue handling – things that plastic surgeons are very adept at,” explains Brzowski. At the time of surgery, it’s up to the skill and technique of your surgeon to perform the surgery in the most precise manner possible to obtain the best (most subtle) scar possible. Once a surgeon has done everything in their power at the time of surgery to obtain a subtle scar, follow-up care takes the wheel. From silicone-based topicals to more robust options, patients can have their scars heal better post-surgery with some modern technologies. One of the processes that decides how subtle a scar will be is tension. The more tension placed on the scar, the worse it will heal. Understandably, this is why one of the largest scars comes with the tummy tuck procedure as so much tissue is under tension during the healing process. The ultimate healer of scars is time. When all is said and done in the OR, and all newer technologies have been applied, only time will heal the scar and decide how subtle it will be. Many patients immediately following surgery are worried and scared by what they see – a fresh incision healing up. The scar can look very bright and seem huge, a disconcerting sight after a surgery meant to improve your look. There is no avoiding the scar, but there certainly is addressing it in the most elegant and precise ways. Consulting with a board certified plastic surgeon and looking at their before and afters is the best way to gauge how prominent the scar will be. In the end, thousands of patients every year learn and understand the scars they will receive and do it willingly for the incredible results surgeons can accomplish. ASHLEY GORDON, MD: I’m here today with this distinguished group of plastic surgeons, and the topic we’re going to talk about today is scars. I know in my practice sometimes the hurdle for patients to decide that they’re going to undergo surgery is the scar. They’re so worried about the scar. BRIAN BRZOWSKI, MD: It’s been said that the only doctors who don’t leave scars are the ones that are on TV, right? It’s the bane of plastic surgery for anything that we do that involves a scalpel, we’re going to end up with a scar. And of course, the priority is to end up with the best scar possible, but patients have to understand the reality that scars will exist. DANIEL MAMAN, MD: We have a scar-care management system that we give to patients actually and we talk to them about it pre-operatively – it’s part of the pre-operative package. What we use is silicone strips and silicone creams. I think there’s no doubt that the silicone strips do have an impact. I think scar massage also has some kind of subtle impact. CAMILLE CASH, MD: In my practice, we utilize a product called Embrace. It’s a medical device that’s applied to the incision a week or two after surgery once the incision has dried. It takes tension off across the incision. SO by offloading the tension across the scar, it decreases the inflammation and the inflammatory response that’s a natural part of scar healing. And so it’s made a significant impact in the quality of my scars. BRZOWSKI: The things that help lessen the likelihood of getting a thick, ugly scar are going to be meticulous suture closure, very gentle tissue handling – things that plastic surgeons are very adept at. MAMAN: I always tell patients, ‘You gotta be patient.’ We know histologically that it takes at least a year for the scar to really mature in terms of collagen transformation and collagen changes. And that things get dramatically better, so what seems like a bad scar in the first two or three months, by a year it’s usually trivial and they don’t actually come back for scar care. But again, it’s important for them to be active and for us to address their concerns. Breast Implant Manufacturers — Does It Matter?